Just like a car with a bad cooling system, the U.S. economy may be overheating, and could break down soon. Why? 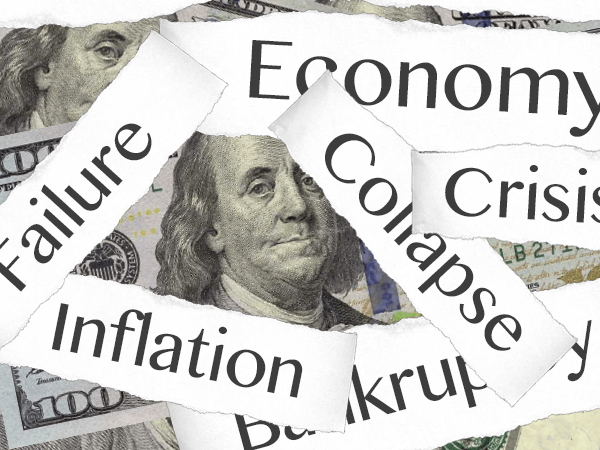 Aside from trade wars, geopolitical tension, and debt, inflation might stand center-stage as the final nail in the U.S. economic “coffin”. According to Torsten Slok, the Chief International Economist at Deutsche Bank, inflation “is the mother of all risks here”. 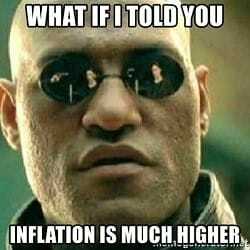 You see, the floundering U.S. dollar, tight labor market, Quantitative Easing and trade wars have all paved the way for rising inflation. And, in a recent survey of global fund managers conducted by Bank of America, 82% expect the CPI index to keep climbing over the next year. Earlier this month, inflation numbers came in hotter than anticipated, signaling inflation pressures could be mounting. The Labor Department reported its CPI rose 2.4 percent year on year, its fastest annual pace in 12 months. Even if you factor out energy and food — factors which the U.S. Government likes to leave out to make the CPI inflation rate more appealing — it’s still 2.1%. The Consumer Price Index (CPI) is a set of methods that track the inflation rate, monitored by the Bureau of Labor and Statistics (BLS). It was designed to help businesses, individuals and the government adjust for the impact of inflation. It worked well until politicians started messing with the methodology in the 1990’s. Since 1980, the Bureau of Labor Statistics has changed the way it calculates the CPI in order to account for the substitution of products, improvements in quality (i.e. iPad 2 costing the same as original iPad) and other things. Backing out more methods implemented in 1990 by the BLS still puts inflation at a 5.5 percent rate and getting worse, according to the calculations. The inflation rate expected by the BLS at the time was only 2.6%, according to the same report. The disparity between these two numbers is alarming. If this “shadow” inflation rate is over 5% now, that might shed some light on the real impact that inflation is having on the U.S. economy. Maybe it’s not such a good idea to bail out huge companies with printed money? Maybe, just maybe, Quantitative Easing served as a band aid, and wasn’t a full solution to the problems stemming from the Great Recession of 2008? And what if this “shadow” inflation rate was revealed? Would that “overheat”, then crash the economy? In fact, “stagflation,” a term not heard since the 1970’s just before the U.S. Government changed methodologies for figuring inflation, is making a return to the discussion. Perhaps it’s time to “pay the piper,” as the old saying goes. Flooding the economy with printed money (fiat currency) can only work for so long. It failed in Roman times, and it will likely fail at some time in the near future. Despite the higher inflation (no matter how high it actually is), gold is overdue for a breakout. According to a recent report from the Dutch bank ING, inflation may just be the catalyst needed for gold to move past $1400… and fast. So as inflation keeps rising at whatever rate the BLS wants to report, it’s a good time to take advantage of the opportunity to diversify some of your portfolio into gold.